Standard vegetable bags have Ambo potatoes (Essex), onion, broccoli, mushrooms (Norfolk), carrots, swede (Devon), Harlequin squash (Linc) and curly kale (Chingford) or salad (Norfolk or Chingford). No potato bags have January King cabbage (Essex or Lanc). 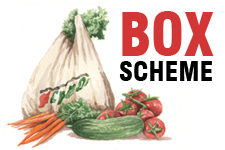 Large vegetable bags have Ambo potatoes, January King cabbage (Essex), onions, broccoli and cherry tomatoes (Norfolk), carrots, parsnips (Devon), salad (Norfolk or Chingford) and chillies (Chingford). No potato bags have Harlequin squash (Linc). Medium vegetable bags have Ambo potatoes, cavolo nero, China Rose radishes (Essex), onions (Norfolk), Harlequin squash (Linc) and Jerusalem artichokes (Chingford). No potato bags have parsnips (Devon). 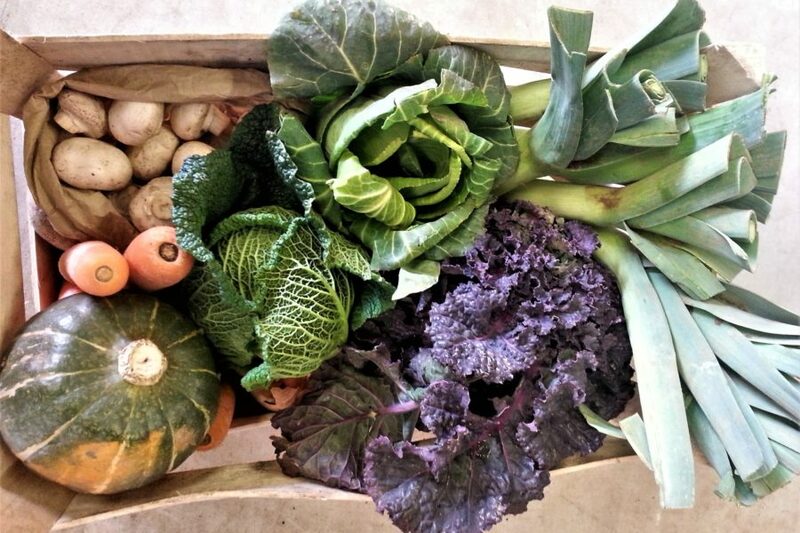 Small vegetable bags have Lady Balfour potatoes (Chingford), carrots (Devon), leeks (Norfolk), cavolo nero and cauliflower (Essex). No potato bags have broccoli (Norfolk). Standard fruit bags have bananas (Dominican Republic), apples, pears (Norfolk), avocado and oranges (Spain). Medium fruit bags have pears, apples (Norfolk), oranges and avocado (Spain. Small fruit bags have pears, apples (Norfolk) and oranges (Spain). Where does our produce come from? We get our produce from Hughes Organics (Norfolk), Sarah Green (Essex) and from organic wholesaler Langridge (especially non-UK fruit). We aim to contribute 15% of the produce in our bags from Hawkwood Plant Nursery (Chingford) or our farm starters; London Grown (Haringey), Daniel (Chingford), Stort Valley Farm (Herts). Contents may vary due to availability.